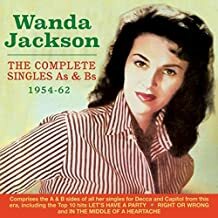 Wanda Jackson lyrics with country guitar chords are for your personal use only, browse this web site for more classic country song lyrics. Most of her music is easy enough for us amateurs to play. Her lyrics represents an assortment of classic country songs that are very entertaining and performed by a lady that should be in the Hall. Wanda recorded many country and rock and roll albums during her fabulous career. She was nominated twice for a Grammy and was a big attraction In Las Vegas from the mid 1950’s through the 1970’s. In 1961 she married IBM programmer Wendell Goodman and he soon gave up his job to be her manager. If you love to play guitar and sing classic country music, I think you would enjoy doing “If I Cried Every Time You Hurt Me” and “I’m In The Middle of a Heartache”, these are just two of Wanda’s songs that we really enjoy picking and singing. Try them and enjoy country music. Add a few Wanda Jackson lyrics too your collection and enjoy pure country music.